Attractive female friends are using smartphone to make selfie while sitting in women's clothing shop with lots of colourful paper bags. They are smiling, posing, laughing, gesturing. Cute girls are sitting and making selfie with colourful paper bags using smartphone in luxurious women's clothing boutique, then watching pictures together. They are smiling and laughing carelessly. 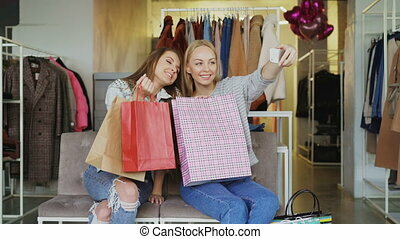 Cheerful young women chatting carelessly and using smartphone while sitting in nice clothing boutique. They are smiling and gesturing enthusiastically. Modern lifestyle concept. Attractive girls are sitting together in women's clothing shop. They are drinking coffee, chatting carelessly and using smartphone. Nice boutique, colourful garments and balloons in background. 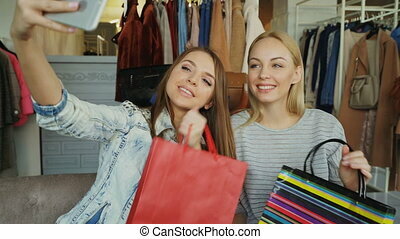 Point of view shot of attractive young ladies making selfie with paper bags in women's clothes boutique. Girls are posing, chatting, and laughing happily. Modern lifestyle concept. Attractive female friends talking and checking smartphone while sitting is modern shopping center. Colourful women's clothing, shelves, hangers and paperbags in background. Beautiful young woman is choosing coat in shop and meeting female friend by chance. Girls are happy to see each other, they are hugging, laughing and chatting while looking at clothing together. Girls are choosing clothes together while standing near rails in luxurious garments shop. They are taking skirt, fitting it to check its size and length, talking and gesturing. 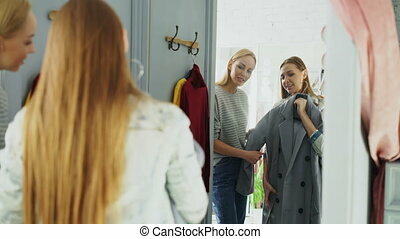 Pretty young woman is checking fashionable coat in fitting room with her friend helping her to appraise garment. They are talking, gesturing and looking at clothing in large mirror.